There’s a whole new cohort of soon-to-be employees. Generation Z is making its first forays into the workforce. Most are still students. The eldest members are a spry 23 years old. So who are they? Only the most educated and technology-savvy group ever to seek employment. Compared to the slightly older millennials, this latest crop of workers has some important differences. Understanding their values and attributes will make recruiting top prospects more achievable. Statistics Canada categorizes this corps as born between 1993 to 2011. That amounts to nearly 7.5 million people, over a fifth of this country’s population. By 2020 it’s estimated they will account for 20% of our workforce. Any way you count it that’s an enormous influx of potential employees who are being described as sophisticated, industrious, collaborative and eager to build a better planet. Big changes happened while these young folk were being raised. They are the first generation born post-9/11. As the offspring of Gen X, they grew up or came of age in the wake of 2008’s recession. Their world has been one of institutional and economic unsteadiness, underscored by widening rifts in society along political lines. They are graduating at a time where predicting hot careers is at best an educated guessing game. Shadows cast by depleting resources and news of climate shift have informed their upbringing. Pair this with being globally connected via social media, and you have a collective alert to both the promises – and perils – awaiting them. 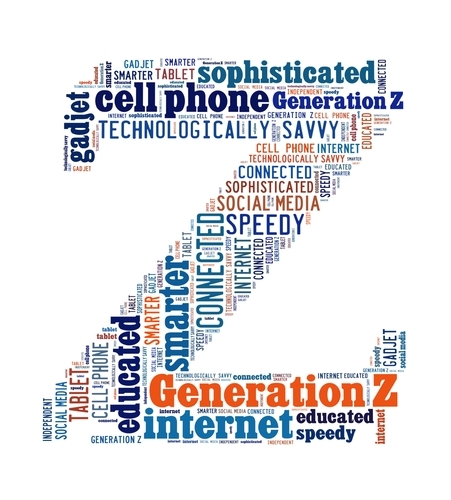 Gen Z’ers are true digital natives who’ve never known life without Internet or smartphones. Not surprisingly they’re accustomed to instant access: to information, peers, even the loading times of electronics. Regarding communication, the fastest way to reach them is by texting, instant messaging or chat. Social media dominates. Many of these mobile phone owners don’t even bother to set up voicemail. Yet a recent study says that 74% prefer face to face communication with colleagues. In the same vein, working off-site as part of a virtual team is less preferred. Consider too that people in their early 20’s have a post-linear digital reality. Events don’t necessarily have to follow a traditional chronology. They watch things when they want to, and learning is available anywhere, anytime. With the accessibility of real-time online info, Gen Z has a larger awareness of today’s realities. They readily connect with peers and web tools to hear about finances and how to pragmatically make a living. Like typical youngsters, this new cohort is less motivated by dollars and more socially conscious. Theirs is an era defined by protests and broadened equal rights. Embracing diversity is becoming hard-wired in them. Resultingly they are even more accepting than Gen Y of racial and sexual differences, and are less likely to adhere to traditional gender roles. Given this increased sensitivity, many are looking for work they feel is helping others (or at a minimum, is doing no harm). Technology and progressivism may be setting up the workplace for a profound generation gap. It would pit kids who are web-wired and socially liberal against workers 40+ for whom the Internet is a second language, and who overall hold somewhat more traditional values. The result will be targeted recruiting tactics that appeal to specific employee pools. Transparency and an organization’s contributions to sustainability will be more prominent. Offering continual technology and learning upgrades becomes vital. GenZ is intent on halting, and hopefully repairing, the ills they see around them. Employers who can provide opportunities to do so will be first to attract this fresh cohort of doers.